My Little Beauty Micellar Water // I really liked this micellar water and although it isn't as good as Bioderma or the Garnier version, it still removed my eye makeup really well. If this was available to buy I don't think I'd get it again as the Garnier version is cheaper and works better. First Aid Beauty Instant Repair Oatmeal Mask | £17.50 // This is one of my favourite face masks and I've already bought another tube. It's perfect for my sensitive and eczema prone skin as the oats helps to soothe and moisturise as well as a gentle exfoliation. Roques Oneil Therapie Himalayan Detox Salts | £37 // These bath salts are one of my favourite bath products and I'm pleased with how long I was able to make them last. You only need a small scoop for each bath and although they are expensive, as a once a week treat then I think the price is ok. They smell amazing and really do help you to fall asleep which I always have problems with. I'm keeping the jar so I only have to buy the refill packs which work out cheaper as the get more for the same price. Pai Comfrey & Calendula Calming Body Cream | £22 // I think I might have got a faulty tube as right from the very first use I wasn't able to get much product out of each pump. I really liked this moisturiser but am trying to work my way through others that I have before buying anything new and I'm currently using one from A-derma. Thierry Mugler Alien Perfume | £49.50 for 30ml, £66.50 for 60ml or £77.50 for 90ml // Although I prefer the extraordinaire version of this perfume, I still enjoyed wearing Alien. Now I've tried it, I probably wouldn't buy it again, but I do still have a mini bottle to use. L'Oreal False Lash Telescopic Mascara | £10.99 // Despite using up the whole tube, I still can't make up my mind on this mascara. I loved the original Telescopic and had high hopes for this. There were days that I loved how it worked and how my lashes looked but others it just clumped together and didn't sit right. I don't think I'd buy this again now that I've tried it as there are other mascaras that work well every time I use them. E.L.F Eyebrow Treat & Tame in Light // While sorting through my make-up I noticed that this eyebrow gel from E.L.F had dried up and was pretty much unusable. This was a good colour match for my fair eyebrows although I never used the tame side. You can't buy E.L.F anymore so for now I'll stick with the Benefit version I'm using at the moment. Phyto Phytoapaisant Shampoo | £12.50 // This was a bit of a disappointing shampoo as I found it incredibly hard to wash out and a couple of times it felt like I still had shampoo in my hair once it was dry which makes it looks greasy and also irritates my scalp. This is designed for sensitive and irritated scalps and I didn't feel like it did anything to soothe my scalp like others have. There are other Phyto shampoos that I like so I wouldn't buy this one again. Phyto Phytobaume Express Conditioner | £14.50 // I didn't think much of this conditioner and the only reason I finished it is because I hate throwing away products. It's described as an express conditioner that you rinse away straight away so I imagined it to be extremely moisturising, but my hair never felt any different after I used it. I also felt like it weighed my hair down a bit despite only using a small amount. I wouldn't buy it again and I'm currently using a Naked conditioner. Ojon Restorative Hair Treatment Plus | £19 for 50ml or £34.50 for 100ml // It feels like all of this months empties have been a bit disappointing but I always try to finish a product if I can even if I didn't like it. This is another one that I really didn't like and it was quite a struggle to finish it. The main thing I didn't like was the scent and I know that's not really important especially in a hair product, but this was horrible. I also found this very hard to use. It's a solid oil that you have to warm up in your hands before you apply it to your hair. It took a very long time to warm up and even then it was very hard to evenly distribute it throughout my long hair. I also didn't think it did much to my hair and for the price, I was expecting great things. Needless to say, I won't be buying this again. I've been meaning to pick up this First Aid Beauty mask! Good to hear you like it! Now I'm definitely going to have to buy it. I've been interested in buying that Phyto shampoo for a while but it's so pricey here in the US. Bummer that it didn't work out, but I guess it's good for my wallet ;) Thanks for the informative mini review! 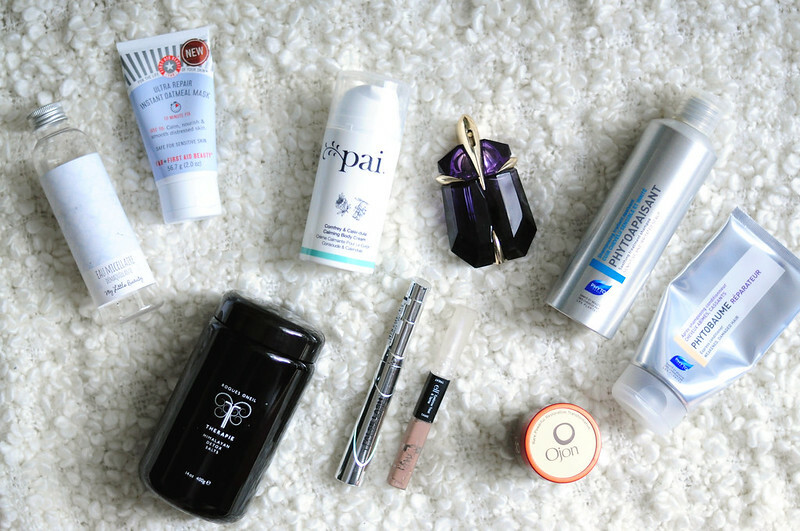 Great round up of empties! I'm trying really hard to use up some of my perfumes as I all of a sudden have so many bottles haha. Would love if you check out my blog! Just followed you on twitter and instagram :) I also wrote about my may empties too!